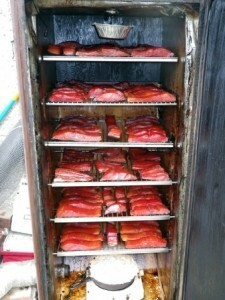 Candy Smoked Salmon …courtesy Iron Noggin! You’re in for a real treat folks! 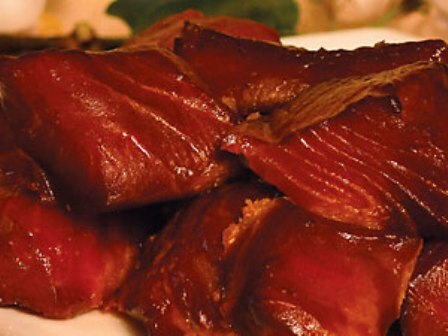 This candy smoked salmon is a very sweet tasting and eye appealing product that’s guaranteed to make you very popular with all your friends! 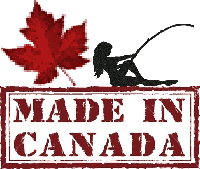 Here’s the goods ……. Start by acquiring any species of salmon that you can get your hands on and cut it into appropriate sizes chunks. Now get your brine ready ……. Place previously prepared salmon chunks into brine for 24 hours. In the meantime prepare your glaze ……. … rack em, dry em, glaze em, smoke em! Fast forward 24 hours ……. At this time you can remove the salmon chunks from the brine, rinse them off with fresh water, pat them dry and then place them on racks to dry. You may wish to utilize a fan during this process to help speeds things up. Once the chunks are dry to the touch, glaze them (a standard squirt bottle works well), let them dry thoroughly, & then repeat the whole process two more times for a total of three glazes. If this step is done correctly it should take 18 – 24 hours. OK so that’s it for the prep work now all that is left to do is smoke them ……. Grab a bag of your favourite wood chips (Matt uses a mix of 1/2 Apple & 1/2 Alder) and spark up your smoker. Smoke on medium heat until almost done and then remove and glaze one final time. Throw them back in the smoker and finish them off to your preferred level of dryness and voila ……. That’s it folks! 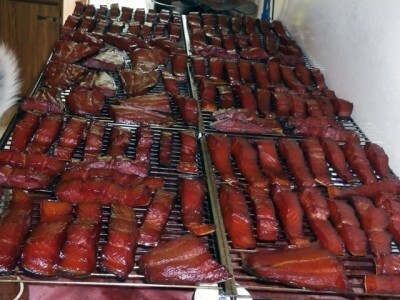 A bit more time-consuming than our simple smoked trout recipe but well worth the effort! Give it a try and I’m sure you’ll agree! 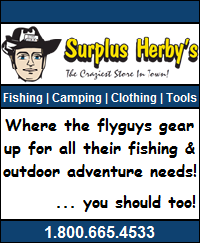 *** got a fish or wild game recipe that you would like to share on flyguys.net? Just email us the details and we’ll post it up for you! 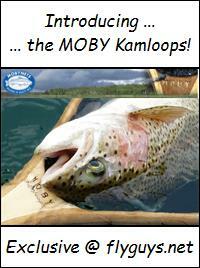 *** for more delicious and organic BC wild fish & game recipes please view the complete list on our recipes index page! 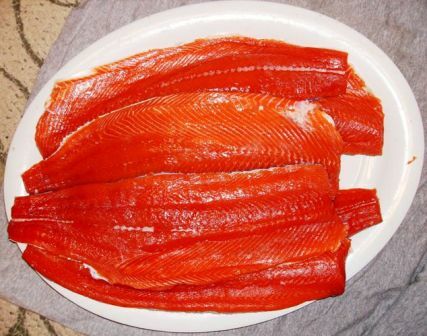 This entry was posted in Fish & Seafood and tagged Candy Fish, Candy Salmon, candy smoked salmon, candy smoked salmon recipe, Candy Trout, Fish, Recipes, Salmon, salmon candy, Smoked & Candied Fish, Smoked & Candied Salmon, Smoked & Candied Trout, smoked candy trout, Smoked Fish, smoked fish recipes, Smoked Salmon, Smoked Salmon Candy, Smoked Salmon Candy Recipe, smoked salmon candy spread recipe, Smoked Trout, smoked trout candy, smoked trout glazed, Trout. Bookmark the permalink. Your recipe calls for 1 “bag” of dry mustard … how much is that?? LOL! I get lots of queries about that one! Most grocers carry various sizes of bulk (bagged) spices as inexpensive refills. The “bag” I refer to in this recipe is one of those. Don’t have one on hand just now, but as I recall, the bags are ~ 5″ x 6″. I use the entire contents of one bag that size for this volume of brine. Hi! When the fish is in the brine, and then during the drying/glazing process, should it be refrigerated? I have smoked fish before, but only after a few hours in a brine. This looks so delicious, I can’t wait to try it, thanks for this recipe! I always brine in the fridge but once that is done I dry/glaze in my basement kitchen … which is slightly cooler than normal room temp but I think room temp would be fine too as the brine has already cured the fish by this time. That’s my method and it has always turned out just fine. Hopefully Matt replies with his process. Are you smoking you salmon as you do you glaze?